The holiday house / Western Algarve has 155 m² with a garden of 700 m². 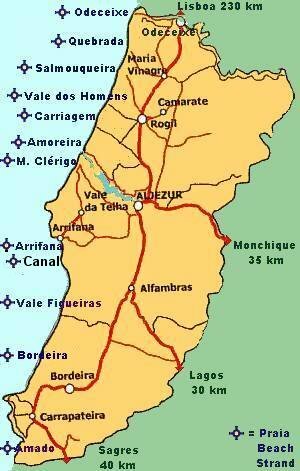 Situated in a very quiet area of Vale da Telha / Arrifana, 4 km from the beaches of Arrifana and M. Clérigo. Holiday house Alaia has 3 bedrooms, 1 of them en suite 2 double beds, 2 single beds), 2 bathrooms ( 1 shower, 1 bath), living-room with closed fire place, Portuguese satellite television (mostly English films with Portuguese subtitles, English book collection, kitchen with dish washer and microwave. Free WIFI, dryer, washing machine Wheelchair accessible, hair dryer, iron. In the garden is a big pool and BBQ area. 21.12.-2.3 2.3.-30.3 30.3.-1.6. 1.6.-29.6. 29.6.-03.8. 3.8.-31.8. 31.8.-28.9. 28.9.-2.11 2.11.-21.12. Prices per night. Minimum nights low season 4, high season 7.